Overhead Door™ Brand has a new all-window option for its Thermacore® model 195, giving homeowners a sleek look with maximum light infiltration. The design enhancement allows homeowners to place either long or short windows across all sections of the door, creating a remarkable exterior. Overhead Door Corporation is always in pursuit of ad​ding new design features for our popular garage door models like the Thermacore® Collection, which consists of some of our most thermally efficient and durable doors. The all-window option gives homeowners more design flexibility to boost their home’s curb appeal, while maintaining the benefits of a premium insulated garage door. – Heather Meiner, Overhead Door Brand Manager. ​Homeowners can select from nine different color options, including white, almond, desert tan, sandstone, terra bronze, brown, hunter green, gray and black. Windows placed on the bottom section of the door have DSB, ⅛” tempered or ½” insulated glass for extra strength. The Overhead Door™ Thermacore® series provides a continuous layer of foamed-in-place, CFC-free polyurethane insulation sandwiched between two layers of corrosion-resistant steel, for maximum thermal efficiency. 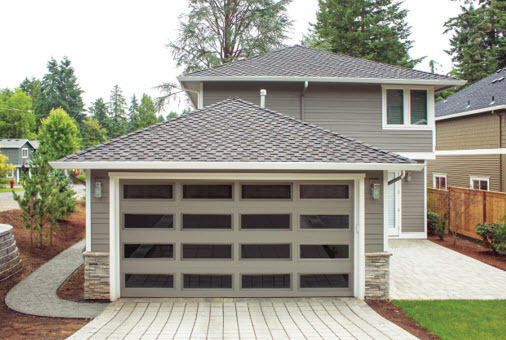 Learn more about our Thermacore® insulated garage doors​ and their window options.